UNL speech and debate team, left to right: Reece Ristau, Daniel Wheaton, Josiah BeDunnah, Amanda Stoffel, Roger Allen, Grace Solem-Pfeifer, Josh Planos and Grace Kluck. The University of Nebraska-Lincoln Speech and Debate team became three-time champions of the Big Ten Conference Challenge Tournament on Oct. 12-13 at Northwestern University in Evanston, Ill. UNL led the field with a two-day point total of 293 points, ahead of second-place finisher Northwestern (163 points) and the University of Illinois (52 points). 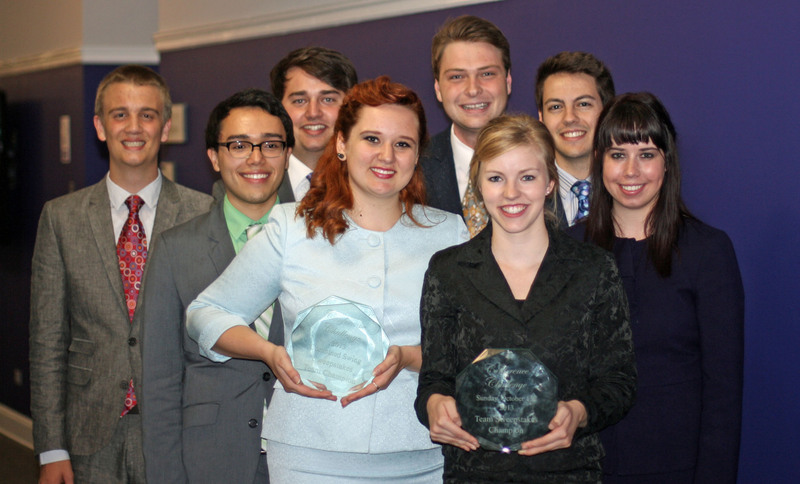 In addition to the team championship in a conference that has a long tradition of excellence in speech and debate, UNL students captured eight individual Big Ten Tournament titles. Students winning conference championships included senior Josh Planos of Omaha in informative speaking and program oral interpretation, senior Grace Kluck of Lincoln in poetry interpretation, senior Amanda Stoffel of Raymond in prose interpretation, junior Reece Ristau of Omaha in persuasive speaking, junior Daniel Wheaton of Cozad in extemporaneous speaking, and sophomore Grace Solem-Pfeifer of Omaha in impromptu speaking and communication analysis. "This is an outstanding accomplishment by our students and team. None of these students receive any scholarship money for being on the speech team, none of them will be drafted into the professional ranks," said Aaron Duncan, a lecturer in the Department of Communication Studies who directs the UNL team. "They compete because of their love for this university and have tremendous passion for sharing their ideas." The team is part of UNL's Department of Communication Studies in the College of Arts and Sciences. The department explores human communication as it shapes and is shaped by relationships, institutions and societies. Its main areas of expertise are interpersonal and family communication, organizational communication, and rhetoric and public culture. For more information on the department or the speech and debate team, visit http://www.unl.edu/cs or follow @UNL4N6 on Twitter.